This race always makes me feel like pulling my hair out. We always seem close to having the right factors in place to beat Loretta but can never quite win this seat. I thought for sure when Van Tran ran back in 2010 that we would take it back, but alas we did not. Unfortunately things got worse for Republicans in this seat with the redistricting commission making this one a bit more liberal. Democrats hold a 12 point advantage in this district and DTS voters are likely to lean a bit more to the lift than in other parts of Orange County. Steve Cooley did beat Kamala Harris in the race for Attorney General in this district and Proposition 8 passed by a large margin. However, Democrats do seem to win on a consistent basis here. Incumbent Congresswoman Loretta Sanchez does make sure to work her district, which does end up getting her votes on election day. She has represented a pretty solid chunk of this district during her tenure in Congress. One advantage for Republicans this time though is that her bank account was wiped out by Kindee Durkee. John J. Cullum a Strategy Manager/Accountant who is running as a Republican. Pat Garcia an Escrow Company Owner who is running as a Republican. Jerry Hayden a Local Independent Businessman who is running as a Republican. Jorge Rocha a Tax Accountant who is running as No Party Preference. This one I find interesting since he sought the CRA endorsement yet was ineligible to receive the CRA endorsement. The factors at play- Loretta Sanchez is the only Democrat on the ballot, has incumbency on her side, and wields a high amount of Name ID. Of the 3 Republicans it appears that Jerry Hayden is running the most effective campaign (although it is still early). Hayden also has the best ballot designations of all the challengers. The real question here though is if the Republicans all split the vote amongst each other allowing Jorge Rocha to advance. Hayden does appear willing to pour some serious resources into this campaign though. Jorge Rocha likely made a very wise decision to run as (NPP) because he has a decent shot of advancing if the Republicans split the vote evenly. If he can raise enough money to raise his name ID he has a shot. I think he will come close to finishing in the second slot but fall just a bit short. 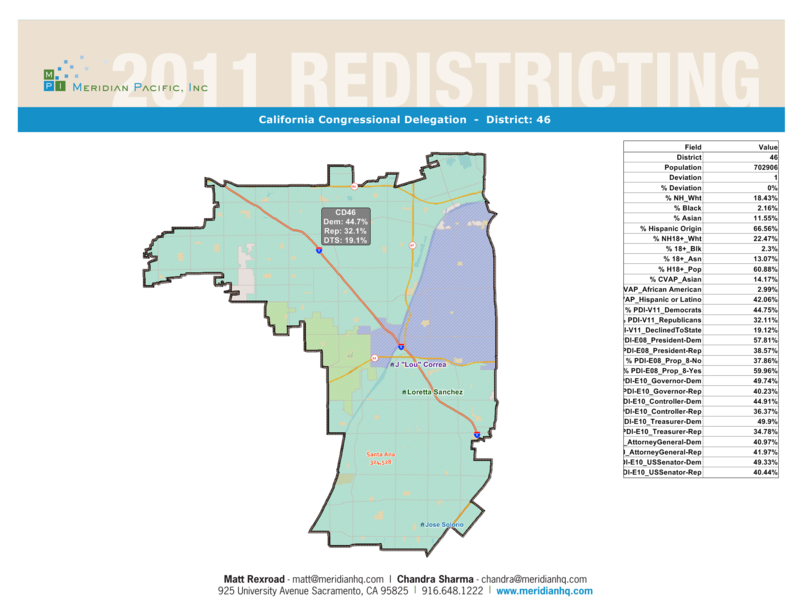 This entry was posted on April 11, 2012 at 12:12 PM	and is filed under 46th Congressional District. Tagged: Jerry Hayden, John Cullum, Jorge Rocha, Loretta Sanchez, Pat Garcia. You can follow any responses to this entry through the RSS 2.0 feed. You can leave a response, or trackback from your own site.